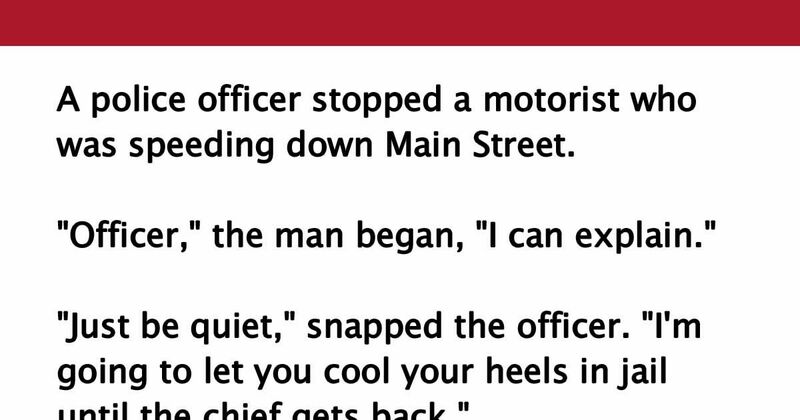 A police officer stopped a motorist who was speeding down Main Street. "Officer," the man began, "I can explain." "But, officer, I just want to say–"
A few hours later the officer looked in on his prisoner and said, "Lucky for you, the police chief's at his daughter's wedding... He'll be in a good mood when he gets back." "Don't count on it," answered the defeated fellow in the cell. "I'm the groom." Yikes! Like and share this joke if you laughed!